There’s nothing like the sense of camaraderie and peace that sweep the globe every two years during the Olympics. While I appreciate hockey, ice dancing and a good game of curling, the summer Olympics always take the cake for me, especially because of the small team of US women gymnasts. This year was no different, with the Final Five taking the competition by storm and earning the most gymnastics medals by one team in Olympic history. And off the mat, the ladies of the Final Five became America’s Sweethearts once again, with golden girl Simone Biles shining a little brighter than the rest. Beneath her incredible power and flawless execution, she’s just an ordinary teenage girl with an absolute obsession for Zac Efron. 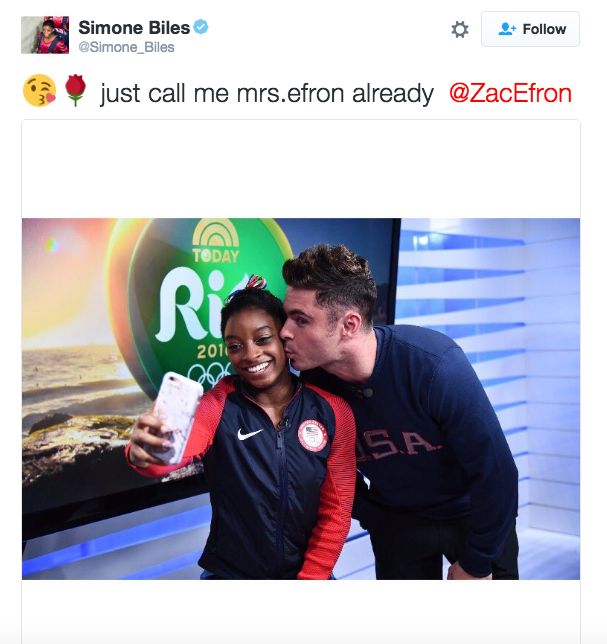 Somehow this fact came out in a few interviews along the way, and the next thing you know, Zac Efron is tweeting about watching Simone and the rest of the girl squad compete. Fast forward a week and, after the girls finished their final routine, they hit up the NBC studio to show off their bling, just like all of the other USA athletes. What was different about this interview, however, was the fact that Zac Efron had traveled to Rio solely to surprise Simone. The results were obviously nothing short of fan-girl amazing.